Seafood for Lent has been one of the most popular categories of grocery catalogues like Woolworths Catalogues. Weekly specials are again on your screen. Browse the product range that contains items 30% cheaper next week. 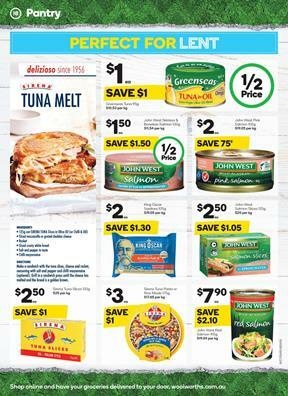 Sealord Hoki Fillets, whiting bites, Australian country harvest, and more products are in the Seafood for Lent section. Woolworths has also a free seafood booklet. Check out canned seafood products like John West salmon and tuna. Woolworths pantry half-price sale covers half-price deals on veg. oils, chilli cucumbers, Plumrose leg ham, and more items. The catalogue also contains frozen and packaged foods. McCain Rustica pizza, Sargents party pack, Birds Eye garden peas are available in the freezer section of Woolies. Streets Magnum sticks 360mL pk4/6 is $6. Save on milk and Greek yoghurt variety on pg 22. Farmers Union Greek yoghurt pouches 130g is a half-price deal. Pay only $1.12 for that. Fridge food is also butter, double thick custard, cheese block, and like-class items on pg 23. Find great cheese and sauces like Red Rock Deli dips. OB Finest speciality bites 100g pack is gonna be in the 2/$7 sale. Save $1 on these products. Bakery deals are available on pg 25. Tip Top English muffin varieties pk 6 will cost $2.50 which is half the regular price. Browse mandarins, apples, and seasonal fruits in the fresh produce on Woolworths Catalogue. A favourite meat selection from the deli and fresh-cut dept. is available on pg 29. Find there 2/$12 deal for many meat products. Tasty sticks, Italian deli products, Don Plain Kransky, Marinated Kebab varieties are on pg 30.